It's a Thursday morning in May and unseasonably, delectably warm. The windows have been open all night and there's a sweetness and strength in the air that you just don't feel in a house that's fossilized by winter. My daughter's third grade class has been working on poetry for the last month, and she's come home with countless poetry prompts over the weeks. I'd smile and listen to her read me William Butler Yeats poetry in a proud, distracted way - I was folding laundry during the recitation after all. As much as I was in awe of a child who wanted to pour through my battered college copy of my favorite poet's collected works, I also sort of took it for granted. Of course you and I share the same heart, dear daughter. Of course we'll lose ourselves in the same verse. Of course you and I will travel together to Ireland, my Moira. It's with you, my girl, that I will see the nation of my heart after fifteen long years away. It didn't seem significant at the time, but that's why we write, to find the significance of the everyday things, right? When I scheduled our trip to Ireland and pulled her out of school, I had no idea I would be whisking her from the poetry unit and bringing her on a tour of the world's greatest country of poets. And when we returned and I found that my own well of poetry had been filled up, it did not occur to me that she and I would have a chance to write together. That we might need to write together. But on this particular soft morning as the sun cast a rose-gold glow on the barely budding trees, it all came together. During our journey, a divine being had tapped me on the shoulder and told me in no uncertain terms that she was coming along for the ride. Not just through Galway, Clare, Mayo, and Roscommon, but across the sea to this patch of green and rocky ground in the Hudson Valley. She wasn't strong on details or on the usual things like a name, but she was rich in elemental energies and would tug at my attention whenever she needed something that only a human woman could provide. 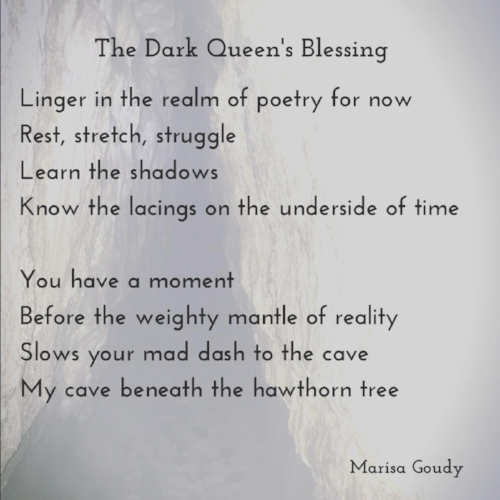 It's she who brings me here, the goddess-faery of the shadows, the one I am (at least for now, at least until she tells me otherwise) calling The Dark Queen. She's the one who set me up to all this poetry writing after years and years of lining my life with prose. It's her voice that demands freedom from sentence and sense and instead laps up against my throat like a tide of a language nearly forgotten. This morning, I was burning the eggs as I worked out the last few lines. When my daughter asked me what she should write about in her poetry journal I looked up from breakfast and art and admitted that I too was writing a poem (she was the first I had dared tell). At that moment, the title was The Dark Queen's Warning. And my girl took that and began. Her eyes glinted when she revealed something she thought was rebellious and new. "The Dark Queen, Mama. She's actually good, isn't she?" Yes, my daughter, she is. In that moment, I realized that every warning is a blessing that's likely to be misunderstood. Imagine it's all swords and no shields, do you? The warriors you see are heavy with armor woven of "not me"
What happens when your babies are burned?